A study by an international team, including the University of Southampton, has shown population maps based on anonymous mobile phone call record data can be as accurate as those based on censuses. Their findings show maps made using mobile records are detailed, reliable and flexible enough to help inform infrastructure and emergency planners; particularly in low income countries, where recent population density information is often scarce. Southampton geographer and senior author on the study, Dr Andy Tatem, says: “Proving the resilience and accuracy of using mobile phone records to map populations was crucial for us, as it has many advantages over traditional census information. “At the moment mapping of populations is constrained by the logistics of census surveys, which just provide a single snapshot of population distributions every ten years. However, anonymous phone data can be examined regularly to map daily, weekly or monthly changes across an entire country, at less cost and with greater flexibility. The team, led by the Université catholique de Louvain and the Université libre de Bruxelles and working as part of the WorldPop Project and Flowminder Foundation used the anonymised mobile phone records of 19m users in Portugal and France, for several months in 2007 and 2008, to generate maps showing the densities of users in different geographic areas. These maps were found to be as accurate as traditional census-based maps, which the researchers generated from data from the National Institute of Statistics and Economic Studies of France and the National Institute of Statistics of Portugal. Furthermore, by combining the mobile and census information with data from satellite imagery, the spatial resolution and accuracy of the census-based maps was greatly improved. Dr Tatem comments, “Knowing where people are is critical for accurate impact assessments and intervention planning, particularly for issues such as healthcare, food security, climate change, wars and natural disasters. Dr Tatem and colleagues are already extending their mapping work to low income regions and have used mobile phone-based mobility mapping to help combat malaria more effectively in Namibia. They have improved the targeting of malaria interventions by identifying communities most at risk. Most recently they have used mobile data to help inform authorities tracking and preparing for the spread of Ebola in West Africa. 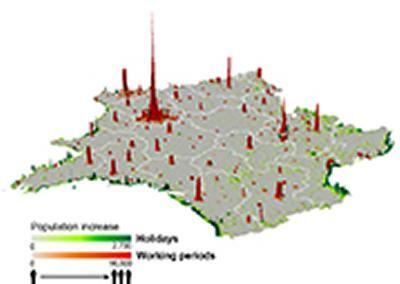 The paper Dynamic Population Mapping Using Mobile Phone Data is published in the journal Proceedings of the National Academy of Sciences.